Cities are currently both climate-culprit and climate-victim. They are already responsible for 70 percent of global energy-related greenhouse gas emissions and 65 percent of global energy demand; they could easily account for more than three-quarters of electricity use by 2030. Cities in emerging economies, where 95 percent of population growth to 2030 and beyond will occur, will account for 70 percent of global growth in energy use through 2030. But cities can also become climate-solvers. Cities as they are now will not pull us out of the climate crisis. But since 75 percent of the urban infrastructure that will exist by mid-century hasn’t been built yet, we have a huge opportunity to shape more resource-efficient cities to avoid the worst effects of climate change and that will also make us wealthier, healthier and more productive. Investments in low-carbon city projects have significant benefits for urban and rural citizens alike. A seminal study by the New Climate Economy found that $1 trillion spent per year by cities on 11 types of low carbon projects would produce $17 trillion in net present financial value through 2050, just from the direct energy savings alone. A follow-on research review found that the economic and social benefits of those investments, such a improvements in citizen health, jobs generated, poverty and inequality eliminated, were many times greater even than the $17 trillion value. As just one example, health benefits of improved heating and insulation can be more than 10 times the value of energy savings. Optimize: Energy efficiency is still the best option because it is the cheapest. Rapid market adoption of innovative technologies and practices, like LED lighting and regular, but still too-slow, turnover of outdated equipment, continue to improve efficiency. Electrify: Electrification is happening across transportation, buildings and even heavy industry. While not appropriate in all circumstances, electrification is assumed under scenarios for limiting climate change to 2 degrees. And it has a myriad of non-climate benefits, from reduced noise and air pollution to more reliable pricing and supply. As the cost curves drop for renewables and storage, electrification will further accelerate. Decarbonize: Recent breakthroughs in generation, storage, energy management and electric vehicles make a shift to clean electricity possible for nearly all uses. 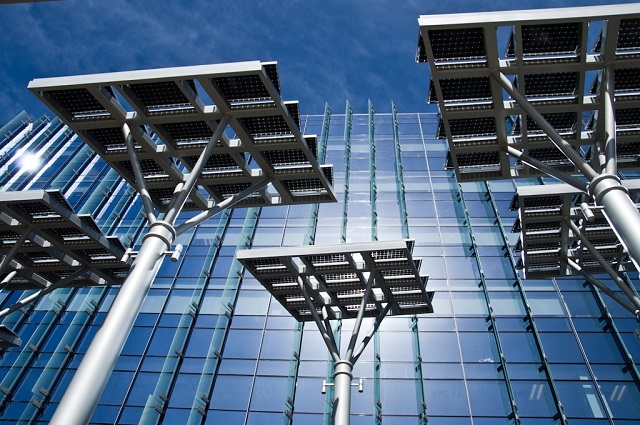 They also make it feasible for cities to optimize their energy loads by time-of-day, and by extension, for policy makers and utilities to shift demand for electricity to times when it’s cleanest – that is, when the wind blows and the sun shines. Incredible drops in the unit costs of batteries, wind turbines and solar cells make it impossible to ignore the cost savings and improved service that come from upgrading. 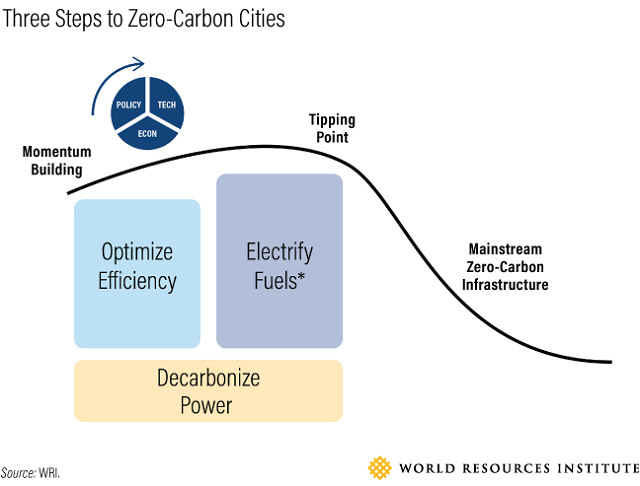 With the “push” of policy and the “pull” of technology and economics, we will reach a tipping point beyond which zero-carbon urban infrastructure becomes the obvious choice, even for late adopters. Emma Stewart is the Urban Efficiency & Climate Director at WRI Ross Center for Sustainable Cities. Eric Mackres is a Building Efficiency Manager with WRI Ross Center for Sustainable Cities.